For the past few years, Globe Education Network schools have faced intense scrutiny for, among other things, their high price tag, poor graduation rates, leaving students deep in debt, and even consumer fraud. Today, the Globe Education Network (GEN) consists of nearly 30 schools, which are owned or partially owned by Terry Myhre and the Myhre family. Twenty of these schools operate under the name Globe University and Minnesota School of Business, while other Globe Education Network schools include Duluth Business University, Minnesota School of Cosmetology, the Institute of Production and Design, Broadview University, Truck America Training, and the Transportation Center for Excellence. Get ready to break the bank if you're headed to a Globe University, or another Globe Education Network school. Not including room and board or fees, Globe's degrees range from $12,870 for a one-year Certificate in Internet Marketing to $93,510 for a four-year bachelor's degree (.doc). College students in Minnesota graduate with an average of $29,800 in student loan debt, which ranks as the third highest in the country. This, however, is nothing compared to graduates of Globe University and Minnesota School of Business. According to data put together at the Minneapolis Star Tribune, 96 percent of students at Globe University borrowed money for school and graduated with an average of $44,824 in debt. At Minnesota School of Business, the results were very similar, where 92% of students took out student loans and graduated with $45,244 in student debt. Equally abysmal is these schools' graduation rates. Both Globe University and Minnesota School of Business are listed as having a six year graduation rate of only 19 percent. This past August, Globe University was forced to pay nearly $400,000 to former dean, Heidi Weber, after a jury decided that the school had unjustly fired her for blowing the whistle on fraudulent conduct occurring at the school. In her suit, Weber claimed that Globe University paid commissions to recruiters, violated multiple accreditation standards, falsified job placement numbers, and used unethical tactics to mislead prospective students. Weber also claimed that Globe/ MSB changed the Medical Assistant Program's accreditation agency, because the school was unlikely to continue to meet the former agency's more stringent accreditation standards. After this change was made, Allina Health Systems, a major employer of MSB/ Globe medical assistant program graduates, refused to accept Globe/ MSB students for externships because of declining accreditation standards. Further backing up Weber's claims, in a sworn affidavit, former Globe University admissions counselor, Hannah Von Bank, says she voluntarily quit her job on July 2012, because she believed the school's practices were "fraudulent, misleading, and unethical." A second wrongful termination lawsuit was brought against Globe/ MSB by former Dean of Business, Jeanne St. Claire. According to St. Claire, she was fired in 2011 after she blew the whistle on Globe's practice of exaggerating its job-placement record and inflating graduation rates. A third lawsuit was recently brought against Globe University/ Minnesota School of Business, by current and former students alleging consumer fraud. The plaintiffs claim "that the company broke state consumer-protection laws, including those prohibiting false advertising, unlawful and deceptive trade practices." According to the plaintiffs, they were misled about accreditations and were told that the school's national accreditation would allow them to transfer to other schools nationwide. Also, according to case documents, they were informed that specific programs were accredited, such as Globe University's Healthcare Management program. However, neither turned out to be true. Plaintiff Sarah Beck was told, for example, that Globe's Healthcare Management program was accredited, but when she tried to transfer Globe's credits, all of the transfer schools rejected them, saying Globe was not properly accredited. Profiting at Expense of the Students they Serve? As I posted in the article, Globe University: Profiteering off the Backs of Students and Taxpayers, Globe University and other Globe Education Network schools offered an institutional student loan called the "Educational Opportunities (EdOp) Loan." The EdOp Loan had an interest rate of 18 percent and money for this loan was provided by Terry Myhre, owner of the Globe Education Network schools. As of March 2013, Myhre held $1,233,571 in loans outstanding to Broadview University students. 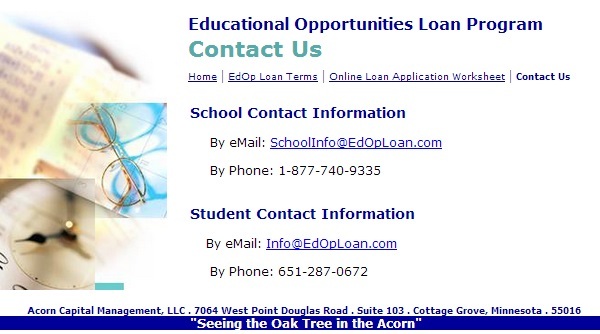 As if this were not distasteful enough, students were directed to fill out the loan application at the website, EdOpLoan.com, which is owned and operated by American Accounts & Advisers, a debt collection agency. In a response to what I wrote about this and other unethical behavior, Globe Education Network CEO (and son of the owner of the schools), Jeff Myhre failed to clarify the relationship with this debt collection agency nor why student borrowers were directed to a site owned by that debt collection agency for an institutional student loan. After looking closer at the ownership history of EdOpLoan.com, we are left with even more questions about whether this family managed group of for-profit colleges truly has students' best interests at heart. Before the debt collection agency acquired the website, it appears that it was registered to the then CEO and president of Academic Funding Group (AFG), Gary Pressley from 2003 to 2007, with his AFG email address even listed as the contact email. This is important because AFG is a former "preferred lender" of Globe Education Network schools. Archives of EdOpLoan.com show that, much like American Accounts & Advisers, AFG used the site to offer high interest private student loans to GEN students. In 2007, the topic of colleges' preferred lender lists became a hot topic because it was found that often times schools had financial arrangements with these lenders, essentially putting profit before the students they were supposed to be serving. Then-New York Attorney General, Andrew Cuomo investigated these illegal inducements between student lenders and colleges. His investigation found numerous cases where lenders would pay kickbacks to the colleges in return for these schools directing students to their loans. Many lenders enticed financial aid officers to direct students to their loans by providing all-expense-paid vacations to resorts and exotic locations, awarding them company stock, and paying them consulting fees. In one instance, it was even discovered that a financial aid director accepted more than $130,000 from lenders. The practice of revenue sharing creates a potential conflict of interest on the part of the institutions of higher education. When and if the institutions direct students to lenders, the direction should be based solely on the best interests of the student and parents who may take out loans from the lenders. Because of these revenue sharing arrangements, however, the institutions have a financial interest in the student or parents selecting the revenue sharing lender, regardless of whether that lender offers the best rates and service for that borrower. The advice the students and parents sought from a trusted source may not be so impartial after all. Later on in 2007, the Department of Education began looking at colleges where all or most of the student loan volume was held by one lender. This raised a red flag at the Department of Education and led to the Department sending letters to 921 institutions which expressed concern that such a high volume of student loans was held by a single lender. The concern was that these schools may be directing student borrowers to one specific lender, and could possibly engaging in revenue sharing with the lender. Broadview University, formerly, Utah Career College was one of the 291 institutions that directed 100% of their federal student loan volume to one specific preferred lender, raising a red flag at the Department of Education. Another Globe Education Network school, the Minnesota School of Cosmetology, also caught the attention of the Department of Education after directing 95% of their student loan volume to the same preferred lender, Academic Funding Group (AFG). 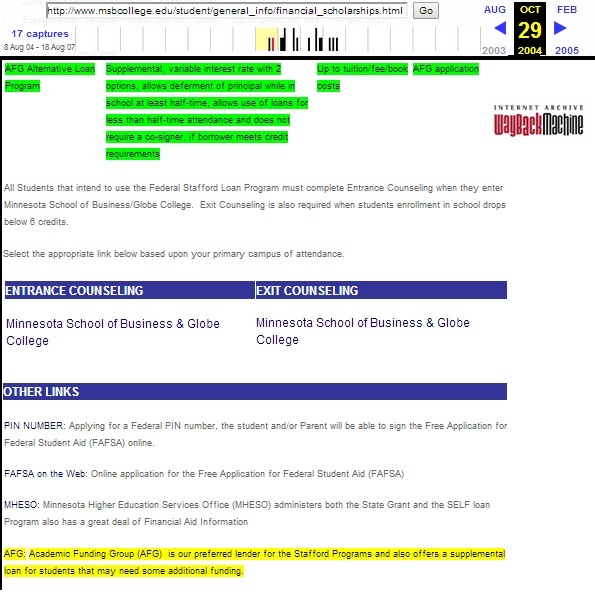 Though Minnesota School of Business and Globe University were not on the list of schools receiving letters from the Department of Education like the other two Globe Education Network schools, both of these schools did, however, prominently market AFG as the preferred lender on their website, rather than providing choices for their students. It would be interesting to see the percentage of students from these schools that borrowed from AFG. As shown in the screenshot above, the Minnesota School of Business website listed AFG as the preferred lender for Stafford Loans and also advertised to students that AFG also offered a "supplemental loan for students that may need some additional funding." At the time, Academic Funding Group offered supplemental funding through the Educational Opportunities (EdOp) Loan. According to GEN member school, the Institute of Production and Recording's website, the Globe Education Network includes two trucking schools, Truck America Training in Shepherdsville, Kentucky, and the Transportation Center for Excellence (TCE) located in Inver Grove Heights, Minnesota. Oddly enough, the same address listed on the Globe Education Network school, Transportation Center for Excellence's website, happens to be the same address of another school by the name of Heavy Metal Truck Training. Why is this significant? Because in 2007 former CEO of preferred lender, AFG, Gary Pressley opened American Truck Training North, inc, which also does business as Heavy Metal Truck Training (HMTT). Pressley is also listed as the contact on another Transportation Center for Excellence website (which also happens to be registered to Pressley as well). So by all appearances, the Globe Education Network relationship with a former preferred lender, never really ended. And that is incredibly troubling. What was Globe Education Network's relationship with their preferred lender, AFG? Were GEN school executives receiving kickbacks to promote loans through AFG instead of listing loans with better terms for students? What is their relationship today? What is/was Globe's relationship American Accounts & Advisors, the debt collection agency which owned the website, EdOpLoan.com where students applied for institutional loans? These are all questions that Globe Education Network students deserve to know the answers to. Because right now, this simply looks like yet another instance where Globe Education Network executives sold out students, placing profit above educating, graduating, and helping the students they serve.